Should the Net Forget? When Should We? It is now a lot easier to embed a Google map in a web site or blog. Previously you had to do some arcane API stuff. Now you can just copy some HTML code and paste it where you want. Similar to how cut-and-paste video works in YouTube. This is very useful if you have a web site or blog that needs to display a location with an interactive map. Another step forward in linking virtual to actual locations. Another useful example of a mashup that makes it easier to create intelligent content without programming. A very thought-provoking post in Carr's Roughtype: Should the Net Forget?. This article describes and comments on a recent NYTimes change in their search engine optimization (SEO) policies to increase the rate at which their articles come up on the first page of a search. The result of this was that many older articles in their archives started showing up in searches. This also created a flood of complaints because the articles were incomplete, sometimes snapshots in time, out of the context that preceded or followed the article. This has caused some individuals embarrassment and difficulties. The NYTimes would have to add sometimes extensive footnotes and rewrites to set the record straight, which they do not want to do, claiming it would be 'rewriting history'. I see an interesting corporate analog. In the late 1980s, as part of an artificial intelligence team, we interviewed executives seeking to gather the expertise they used to run the company. The object was to be able to leverage this knowledge in new ways and make it more available for people at all levels. One interviewee made the point that there are some things we do not want to remember, or at least not make them easy to remember and re-apply. Even very clever knowledge can be misapplied in incorrect contexts. The mantra of AI at the time was that this was true, but all you had to do was to add the context of application to the system as well. That turned out to be much more difficult than we thought, and very high level knowledge applications of this type did not succeed. What worked were relatively narrow and focused applications of knowledge to problems. Looking at the similarity to the NYT case. Its not just a matter of finding a solution via search, it requires adapting the solution to the current situation. Just because an item has many inbound links does not mean it's the best solution at this time, or under these situations. Its not to say we should forget, the historian will eventually be tasked to reassemble the bits of information. It's that we should not be so sure that an optimal search is best for both the provider and the user of that knowledge. A survey, with lots of pictures, of transhumanist technologies. Broad definition of transhumanism here: "... Not just technology as in gadgets you get from Best Buy, but technology in the grander sense of strategies for eliminating disease, providing cheap but high-quality products to the world's poorest, improving quality of life and social interconnectedness ... ". Some time ago I reviewed Ken Steiglitz's book: Snipers, Shills and Sharks. A good semi-technical and very readable overview of the science of auctions. I was surprised to find auction process overviewed in a seemingly unrelated book, Amy Stewart's Flower Confidential. Another one of those non-fiction books that brings to life a seemingly simple aspect of business. Here its about the business of cut flowers. A long time follower of things horticultural, its a fascinating view of the complexities of that business. Back to auctions .... along the way Stewart gives an excellent description of the Aalsmeer flower auction in the Netherlands (p. 219-) Not surprisingly this is held as a Dutch auction, well described in Steiglitz's book. Dutch auctions are very different from English style auctions we commonly see. 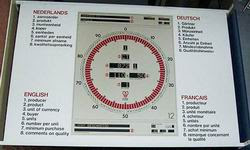 Instead of a bid starting low and sale going to the highest bidder, Dutch auctions start at a high bid and a clock is used to drop the price at each prescribed tick. A bidder can stop the clock and get the purchase at that price at any time. The psychology is quite different. It's often used for large and partial lot auctions. Stewart also talks about how the Aalsmeer auction insists on hands on interaction with the product, while it could be more efficiently done online. The symbolic interaction between real and virtual world is worth thinking about. While you could build a technical visual system to accurately grade flowers, IBM's Veggie vision is a related example, there is something to be said for a physical interaction, especially for a product that has a strong sensual component. 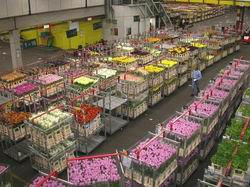 A visit to the Aalsmeer flower auction is on my list. An AdAge article on agency BBDO's work on the rites of consumers. " ... After a nine-month study of 5,000 people in 26 countries, the agency narrowed our daily rituals into five stages, each of which represents an emotional state that influences behavior ... " . Update: This article has gone behind a registration wall, but you can find out more about BBDO Rites here, and other blogs. PC Mag publishes a list of their Top 100 Classic Web Sites. As I historian of technology, this is a great example of what is out there. What really works, and how to create sites that attract and keep customers. Sites you know well, and sites you have never heard of. I am sure you have tried to do a search for a person online. If you are successful depends on a number of things. One is the name you are looking for. If the name is unusual, its usually not too hard to find. If its a 'smith', or if its shared with anyone who is a celebrity anywhere, its a lot tougher. One niche market that is being explored are name search engines that look at social networking sites to such as Facebook and Myspace to find names. An article on the emerging phenomenon in the current BusinessWeek with some sample sites. This week, one of the people searching sites: Spock.com (Beta) was launched. I explored a bit. It gave some interesting, but I would say incomplete results. A search on Google gave more complete results. It also seems to be gumming up its tagging capability with celebrity mentions, which is precisely what I do not want. I want to see real people. Also had some serious systems problems, likely due to startup conditions. We have worked with Bob Johansen of the Institute for the Future since 1978. They have helped us in many ways, including early involvement in the concept development of our innovation centers. Bob has now written a new book: Get There Early : Sensing the Future to Compete in the Present. I received an early copy and just finished it. P&G's Bob McDonald is one of the jacket commenters. The book is a companion piece to IFTF's ten year forecast, 2006-2016. That map is included in the book jacket. I have participated in some of the sessions that led to this map. The book contains quite a few P&G examples, most fairly well known An early one is their recommendation that P&G do a reverse mentorship in the Biotech area. I am unfamiliar with the actual results that derived from that example. I was involved with other innovation oriented work, and their input there was very useful. The book's title idea is the same one that has driven IFTF since the 70s. You know you can't predict, so you need to forecast, so you can get get there early by sensing the future. It has similarities to scenario analysis. The book outlines IFTF's techniques, which originated with the 'Delphi Technique' at the Rand corporation. And developed and expanded more recently their involvement with VUCA: Volatility, Uncertainty, Complexity and Ambiguity. They apologetically trace this approach to its US military origins. The other technique highlighted is what they call their Foresight-Insight-Action cycle, a theme throughout the book. The difference between problems and dilemmas is nicely put. It emphasises an understanding of what can be done about challenges in business. Towards the end of the book Johansen talks about after action reviews (AAR) which emphasizes learning from failures. That research is often about 'failing in interesting ways'. Something we do not do very well. As someone with engineering origins, I have always been problem rather than dilemma oriented. The book makes the case that in a VUCA world that cannot often be done. I think that is overemphasized in the book. There are problems that can be solved analytically. If we don't even try, we won't solve them. Note the relationship to other topics in vogue today .... design vs engineering and complexity vs optimization. His view of Powerpoints is intriguing, suggesting that they be used non-linearly, the way a person uses cuts in an iPod. I like the idea, as long as the elements are true when they stand by themselves. Lots of interesting examples in this book gathered over their years of consulting. In the middle of the book there is a large section on 'immersion', which is a broad term they use for all kinds of simulation. Nicely done in its breadth, but not in its depth. That being my own world, I would have hoped they would provide more examples of digital simulation, and some examples of how to get started. Simulation also quickly gets into the realm of the difference between forecasting and prediction. It's hard to separate the difference for non engineering management. Yet learning in simulation environments is often be more about the journey than arriving at a precise solution. I found this book to be a fun and easy read, but I have been involved with portions of this process for years, and have an established interest. Others may find this like many business books, with no direct answers, and thus too squishy to add to the reading list. It is worth a read, and the map is worth trying to understand, the footnotes have some excellent links that remind me of related work we have followed. Best Quote:" ... Great Managers help eccentric people produce" . Peter Drucker to Bob Johansen and A.G. Lafley ... A challenge? John Clippinger, who connected with us back in the 90s, has a new book out: A Crowd of One. Have not read, but it does look intriguing and it's on my list.
" ... Why do drivers warn people they'll never meet of police traps by flashing their lights? How did eBay's community of trust make it victorious over the competition? Why do terrorists tend to come from richer, better educated families? These are some of the questions posed by Clippinger, a senior fellow at the Berkman Center for Internet & Society at Harvard Law School. Calling on philosophers, scientists and economists for support, Clippinger looks to human evolution for answers, and expounds on how human phenomena like language and social customs evolved not for individual advancement, but for the benefit of the group..... "
Making your presentations stickier, from Presentation Zen, well done.